Retiring early has been on my mind a lot lately. 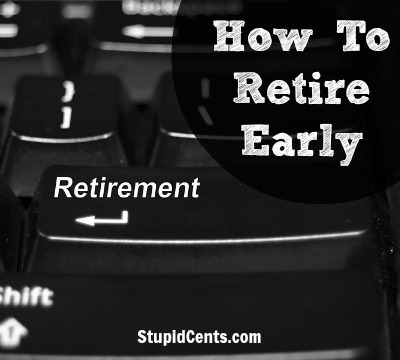 Before, I started blogging, I honestly knew nothing about early retirement. I didn’t think anyone retired early, and I thought most people just retired at age 65 or later if they could. I just never gave it a second thought. However, then I came across personal finance blogs, specifically Mr. Money Mustache, and after reading a couple of articles about early retirement I became hooked. For me, early retirement does not mean that I will just be sitting around and doing nothing all day. I never see myself completely not working, I see early retirement more as financial independence. That means that I’ll have the choice in whether or not I will work because I won’t be dependent on income. I can do what I want and when I want. I can pick up and travel. I can have more time for my future children. The list goes on and on. Depending on how early you want to retire, increasing your income is very important. Of course the earlier that you want to retire, then the more income that you will need. Aim for those promotions and succeed in getting them! If you are increasing your income, then lowering your expenses can help you reach early retirement even quicker. Even if you can’t increase your income by enough, then lowering your expenses is still important, and early retirement may still be possible. Cut out any unnecessary expenses, and live the life that you truly want to live. Saving as much as you can is possible. Live off of 50% or less of your income, and then you will be on your way to retire early. For me, I want to get rid of all debt. Lowering the amount of bills that I have is very important. However, some prefer to keep low interest-rate debt and invest those funds as well. Determine what is best for you and what will allow you to retire early. What do you need for retirement? This may be the most difficult question to answer when wanting to retire early. You should add up your total expenses and how much income you need each year in order to live. Don’t underestimate what you spend. You may be spending more money after you retire because you will have more time, or you may spend less. Be realistic with how much you think you will be spending when you retire early. You need to think about any home expenses, child expenses, health care, food, cars, insurance, fun, entertainment and so on. If you save 25 times what you spend each year, and withdraw 4% each year, then your retirement funds should last your life time. This is how you can reach early retirement. How will you make income for early retirement? To retire early, you might also want to have extra money coming in. You can invest in dividend paying stocks, or invest in other ways to make passive income. Do you want to retire early? Why or why not? I’m trying to do all the above Michelle, a little of bit everything: kill debt early; save, save and save, and invest wisely for passive income. It’s not easy but I hope the journey is rewarding.